Taken from Hill Country Weavers Prairie Bliss Vol. 1: "Welcome Baby with a lightweight blanket that also makes a great nursing shawl. 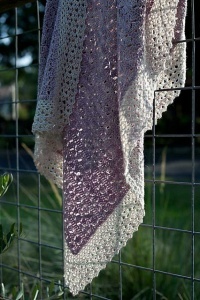 Crochet the body back and forth in rows to create the diamond texture, then frame it with an airy edging worked in a contrasting yarn." Size US F-5 Crochet hook (or size needed to obtain gauge) is required but not included. Finished Measurements: 32" x 39" after blocking. Gauge: 18 sts & 10 rows over 4" in body pattern before blocking. Color Shown is Pashmina-Sugar Plum & Merino Light- Antler. $140.00 -- Kit price including yarn only (no book or pattern).